Whether she is helping students find their voices through poetry, introducing them to authors around the world via Skype, or guiding them as they recite words of inspiration from Civil Rights leaders, Joyce Ashuntantang is a passionate believer in the power of words. An associate professor of English in the University of Hartford’s Hillyer College, Ashuntantang also is a published poet and actress with a growing, international reputation for her stunning poetry and colorful and dramatic readings. In recent years she has read at international poetry festivals in Nicaragua, Colombia, and Greece, while also bringing her unique voice to a number of events in the Hartford area. This week, Ashuntantang is playing a key role in the University’s “Empowering Change” initiative, a weeklong series of events celebrating the 50th anniversary of the of the Civil Rights Act, as she and fellow Hillyer faculty member Anthony Rauche present an interactive program on Music and Poetry for Social Change. Ashuntantang has been working with students to help them give voice to enduring words from the Civil Rights era. This grew out of a popular program she started called “Words Like Trees,” in which students recite the words of prominent African Americans each year during Black History Month. Associate Professor Joyce Ashuntantang brings to her classes a rich, multicultural background and a passion for the written and spoken word. 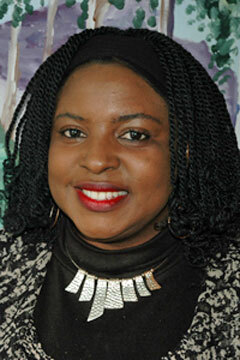 Among the themes that run throughout Ashuntantang’s teaching, poetry, and scholarly work is her connection to her native Cameroon in western Africa. This past summer, she traveled to Cameroon as part of her work on a book that will use poetry and photography to document the disappearing folk art of the Manyu region of Cameroon, where she is from. Ashuntantang has written many poems about Manyu crafts that tell vivid stories about the crafts and their role in the lives of Manyu women, in particular. One poem, Asoreh, tells a story centered around an “asoreh,” a richly decorated dish that Manyu women created for their husbands. When the husband died, the asoreh was broken in a public ceremony, indicating that the woman was now free to re-marry. Ashuntantang’s heartbreaking poem is told from the perspective of a woman who has just witnessed the breaking of the asoreh after her husband’s death. In the poem, the woman talks about her deep love for her husband and wonders whether she will ever be ready to love someone else. Ashuntantang displays Manyu crafts in front of a now rarely used mud kitchen in Ashum Village, Cameroon. The crafts belong to Abraham Ashusong, custodian of Manyu artifacts and folklore. The child with Ashuntantang is Ashusong’s grandson. Photo by Tabi Zama of TGIM Cine School. Read Asoreh and other poems by Ashuntantang based on Manyu folk art. See video of Ashuntantang reading her poem, Asoreh. Ashuntantang is hoping that her work will help preserve disappearing Manyu crafts like the asoreh—and she also wants to use her poetry to help preserve Kenyang, one of the disappearing ethnic languages of Cameroon. While the official languages of Cameroon are English and French, the country has more than 200 ethnic languages, many of which are dying as those who know them pass away. During the “Hartford Loves Poetry” festival in April, Ashuntantang read two poems that she wrote in Kenyang.